* Runtime below v1.11 will not be able to load meshes baked with runtime 1.11 and above. * Runtime below v1.11 will not be able to load 1.11 effects, '''[[#Plugin_status|make sure you upgrade your runtime / plugins as well before switching to this version]]'''. * [[File:CParticleRenderer_Billboard.png|Billboard renderer]] [[CParticleRenderer_Billboard|Billboard]] & [[File:CParticleRenderer_Ribbon.png|Ribbon renderer]] [[CParticleRenderer_Ribbon|Ribbon]] renderers : Only allow float3 Colors for NoAlpha and Distortion BillboardingMaterial, throw an error otherwise, rendering implementations silently supported them, but uploaded bad data to the GPU, producing visual glitches. * Removed access to old legacy nodal editor. Contact us if you need to access it again. * [[File:CParticleEvolver_SpatialInsertion.png|Spatial insertion evolver]] [[CParticleEvolver_SpatialInsertion|Spatial insertion evolver]] : now properly does NOT insert particle with infinite position. * Layer (Descriptor): now exposes BoundsPositonField and BoundsSizeField: particle fields used to compute Bounds (page/medium/mediumCollection). * Editor now cleans-up effect files when opening them: previous versions of the editor were sometimes leaving dangling nodes in the effect, that didn't appear anywhere in the UI. * Script optimizer : Fixed incorrect constant-folding of compare operators, when comparing two fully constant float values, an integer compare of the values was done, instead of a floating-point compare. * Script optimizer : Fixed 1.11.0 incorrect constant-folding of compare operators, when comparing two fully constant float values, an integer compare of the values was done, instead of a floating-point compare. * Script optimizer : Now iteratively applies optimization passes as long as optimizations are still being made. 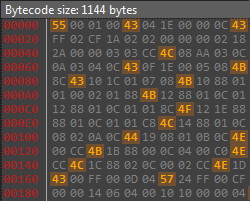 Currently all scripts converge within 1 to 2 passes only. * Camera backdrops : fixed minor memory leak when resetting scene. ** 'New asset' window now has a checkbox to auto-open the new asset right after it has been created. Useful when content-browser has too many items displayed or a filter active and you don't want to reset the filter to find and open your asset. Can also be accessed from the "User" category of the project settings. ** PK-Editor.exe : now accepts a '-h' or '--help' command-line switch to display the list of available switches. ** Renderers : Can now trim particle textures to reduce overdraw (Experimental). Texture viewer now displays trimmed vertices if the texture has a .pkat containing trimming data. 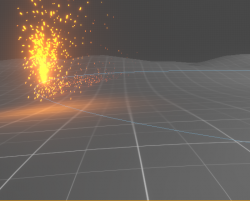 The particle renderer used in the editor currently ignores the trimming information, and will still render the particles as regular billboards, however, if you are using the SDK in your in-house engine, you now have access to that trimming data. ** Renderers : Can now trim particle textures to reduce overdraw (Experimental). Texture viewer now displays trimmed vertices if the texture has a .pkat containing trimming data. 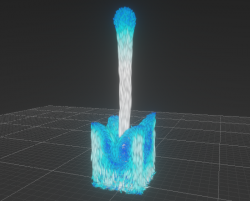 The particle renderers used in the editor and the Unity/UE4 plugins currently ignore the trimming information, and will still render the particles as regular billboards, however, if you are using the SDK in your in-house engine, you now have access to that trimming data. ** [[File:CNEdEditorBackdrop_Model3D.png|Mesh backdrop]] [[CNEdEditorBackdrop_Model3D|Mesh]] and [[File:CNEdEditorBackdrop_AnimTrack.png|Animtrack backdrop]] [[CNEdEditorBackdrop_Animtrack|Animtrack]] backdrops now provide default builtin backdrops for convenience. They have a dropdown that allows you to pick either a custom backdrop as before (path to an FBX file), or one of the new default builtin backdrops.